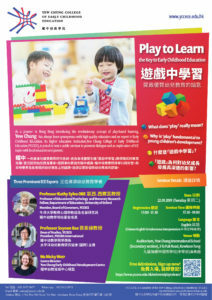 As the first in Hong Kong to introduce the revolutionary concept of play-based learning, Yew Chung has always been synonymous with high quality education in Hong Kong, and an expert in Early Childhood Education (ECE). 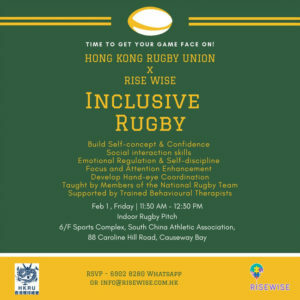 During the event, the members of the HK National Rugby Team will be coaching the kids, teaching them different rugby techniques, training their cooperation, team work and social communication skills, as well as having fun games and activities on the field. The Sequential Oral Sensory (S.O.S) Approach to Feeding workshop is a trans- disciplinary program for assessing and treating children with feeding difficulties and weight/growth problems from birth to 18 years. This talk is beneficial for anyone looking for practical advice regarding Dsypraxia, whether you are a classroom teacher or PE teacher, parent or allied health professional. Children grow up fast and before you know it the tween years are upon you. It’s challenging when a neurotypical child enters adolescence, but how do we prepare and support our children with special needs for this life-changing milestone in their development? 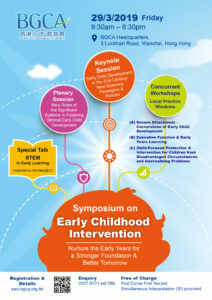 BGCA are going to conduct a Symposium on Early Childhood Intervention on March 29, 2019 with the theme of “Nurture the Early Years for a Stronger Foundation & Better Tomorrow”. 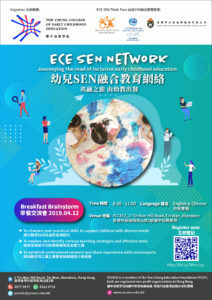 Join early childhood professionals and advocates from around the world who will assemble in Macao to engage in work and dialogue to impact the futures of young children and their families. Did you know it is possible to have dyslexia in Chinese, or English, or even both? Join F.O.C.U.S to explore the unique characteristics of these two languages and to gain practical tips on how to manage dyslexia in Chinese and/or English.